If you think MMA is just a toy for small hip startup game companies -- you'd be wrong. From car companies like Kia and Land Rover to banking companies like ING and retailers like Starbucks, Walgreens and Macy's, enterprises are leading the charge in this space -- and winning the fight for marketshare in their verticals. 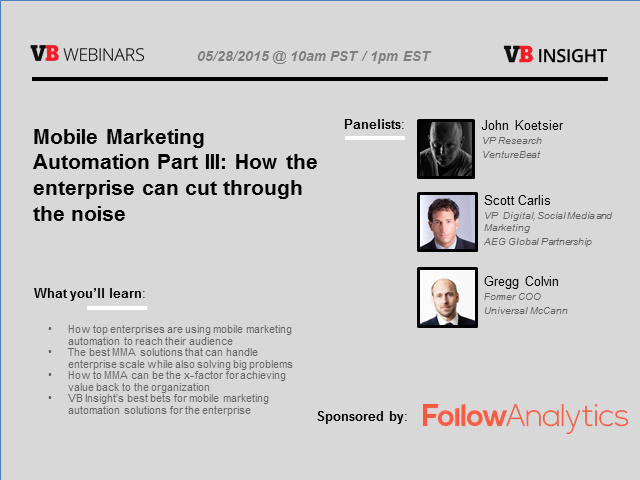 When it comes to mobile marketing automation, the enterprise has a unique problem -- many MMA solutions are built for small app dev houses and don't have a feature set equipped to tackle enterprise-grade demands. VB Insight surveyed 375 mobile developers and 1.8 million apps to uncover the hottest MMA solutions. We also figured out the best bets for the big guys and some best practices from industry leaders.